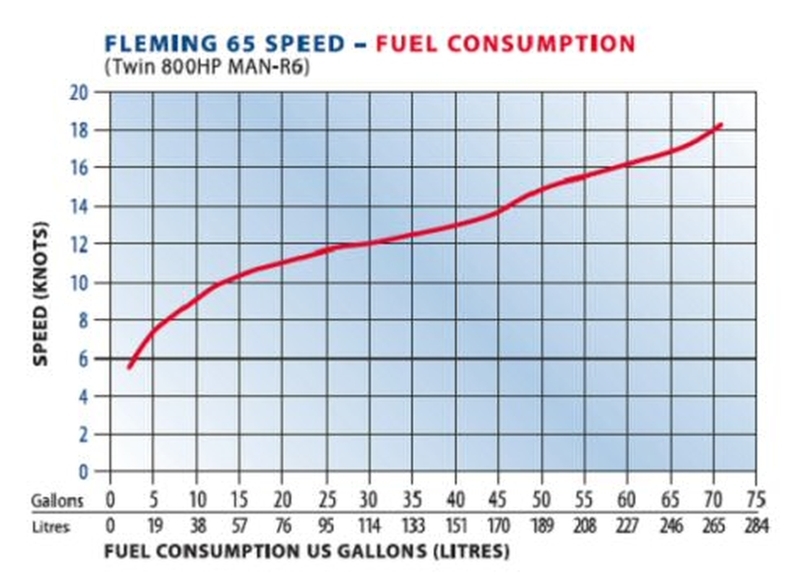 The Fleming 65 was introduced in mid 2005 in response to a strong demand for an intermediate Fleming between the 55 and the 75. 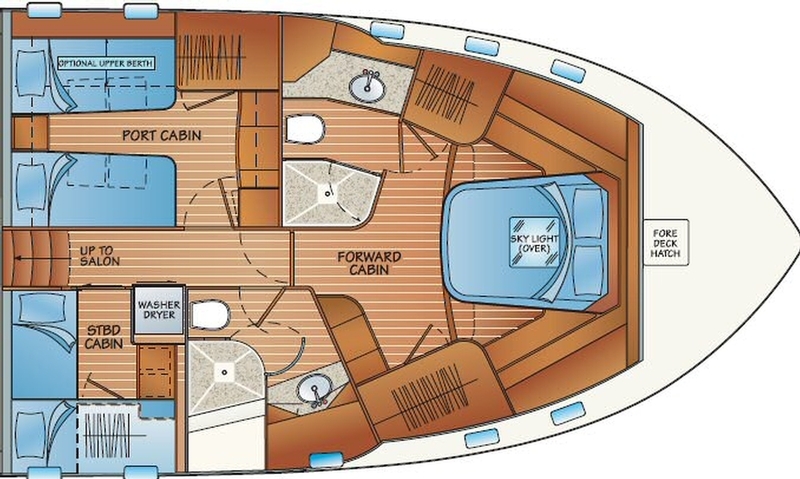 Her layout is very similar in concept to the 55, but the 65, being around 70% larger in displacement, offers much more interior and deck space than her smaller sibling. 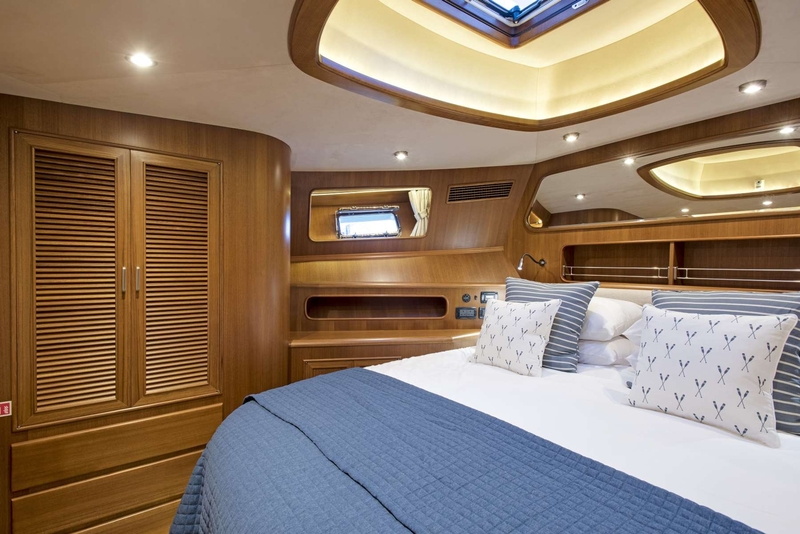 We are very proud that a panel of thirteen judges from the Internationally respected 'Yachts' magazine voted the Fleming 65 best yacht in her class, worldwide, for 2006. Tony Fleming and his daughter, Nicky, went to Cannes to receive the trophy. 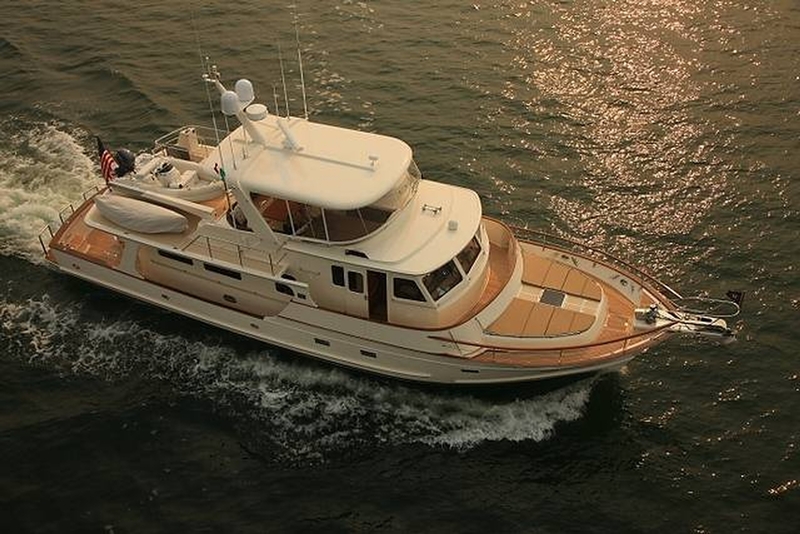 As of February 2010, 24 Fleming 65s have been built at the highly regarded Tung Hwa yard in Taiwan, which has built every Fleming yacht since they were introduced in 1985. As with all Flemings, special attention has been paid to the ease and safety in which the heavy duty ground tackle is set and retrieved. 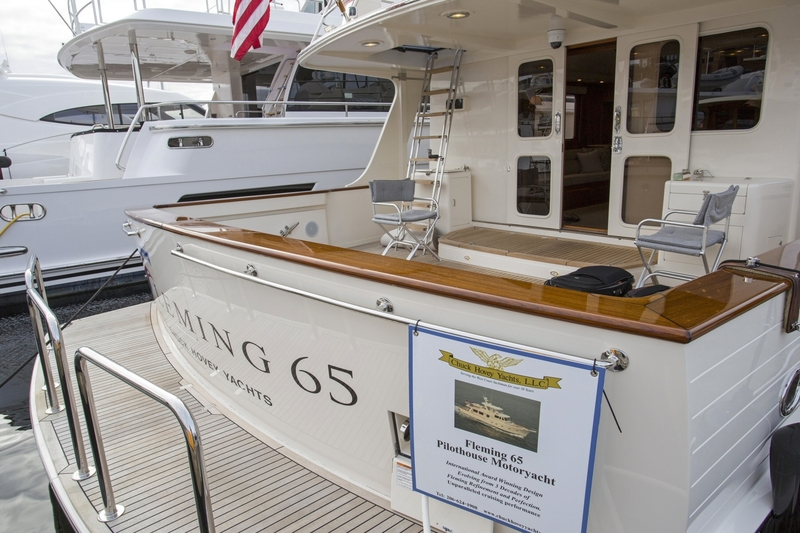 Originally designed for the Fleming 75, the 65's anchor platform is especially large and robust. As with all Flemings, special attention has been paid to the ease and safety in which the heavy duty ground tackle is set and retrieved. 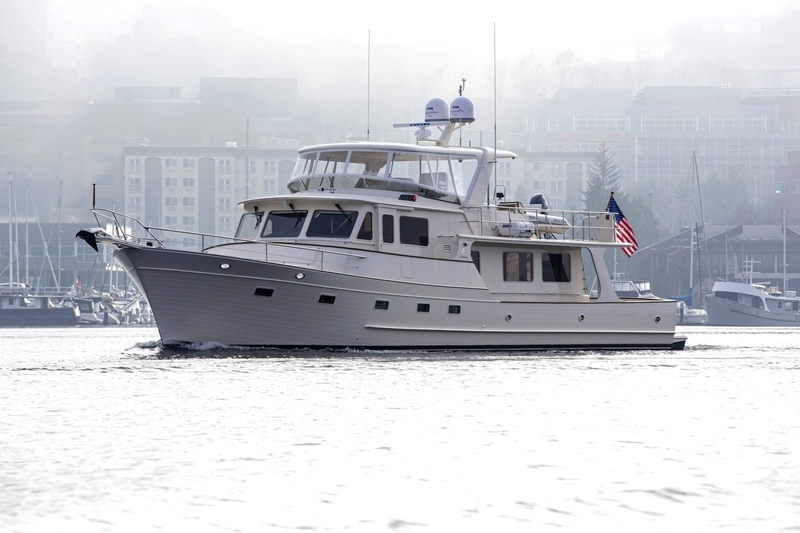 Originally designed for the Fleming 75, the 65's anchor platform is especially large and robust. 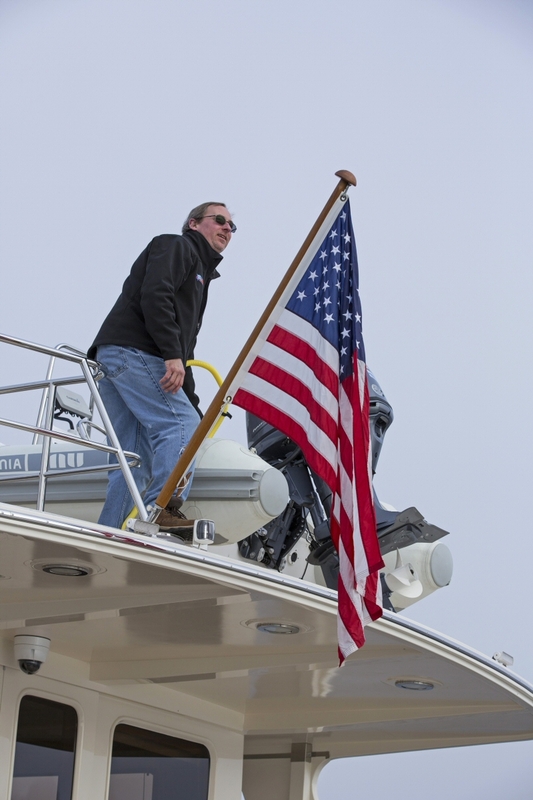 The anchor platform accepts two anchors, each of which can be controlled by a handheld unit at the platform or by windlass controls at both pilothouse and flying bridge stations. A Lofrans Titan electric windlass system is standard, and a Maxwell 3500 hydraulic system, as shown, is optional. 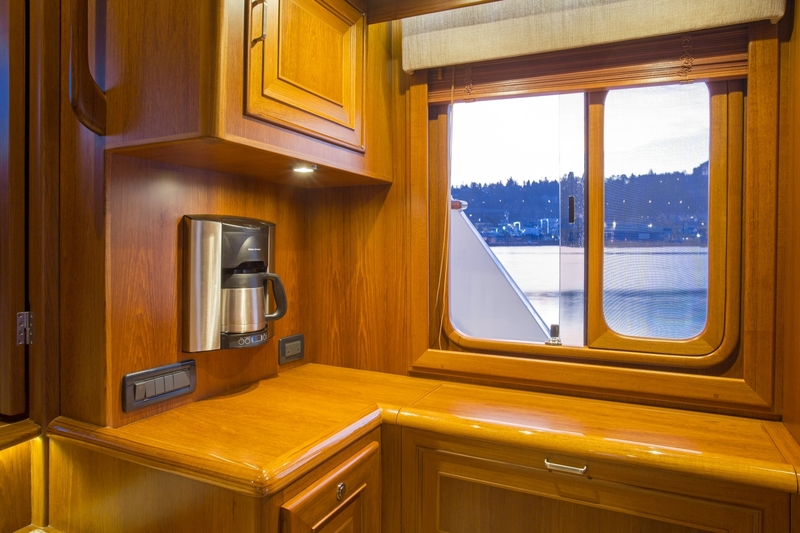 There are port and starboard storage lockers to each side of the platform base, where salt and freshwater washdown hose bibs are located as well as two alternative, 50-amp service outlets that are convenient when docking bow first. 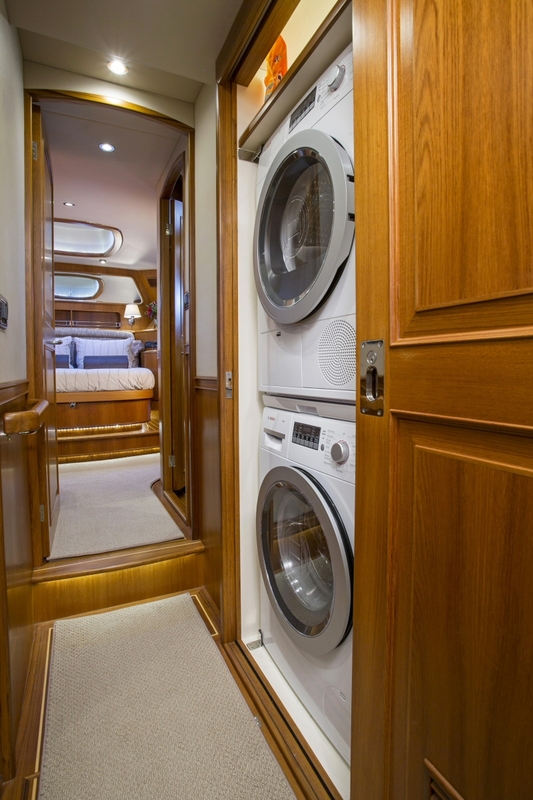 A centerline hatch opens for access to the double chain locker, which is separated from the yacht's interior by a collision bulkhead. 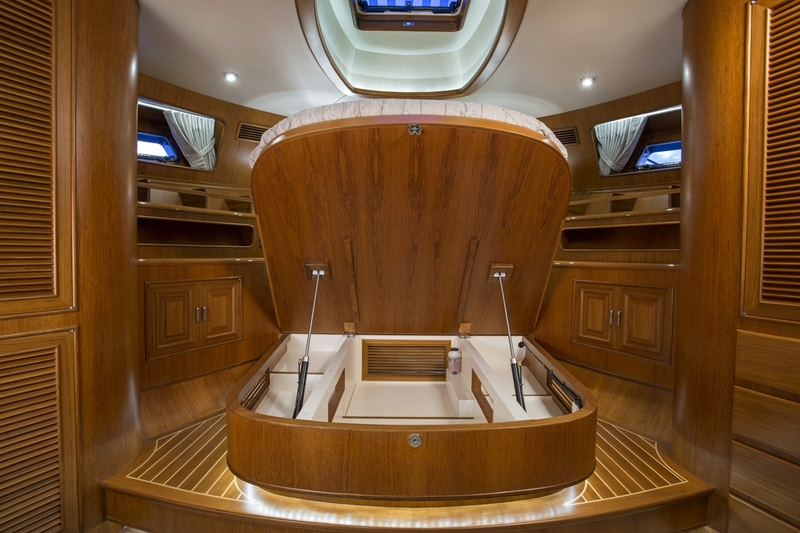 The locker can house two 300-foot lengths of anchor chain and several hundred feet of rode. It is also big enough to stow fenders and extra lines. It drains overboard just above the waterline, keeping the bilge clean and dry. A teak caprail and handrail are standard, and an optional stainless steel, oval shaped handrail can be ordered in lieu of the teak handrail. 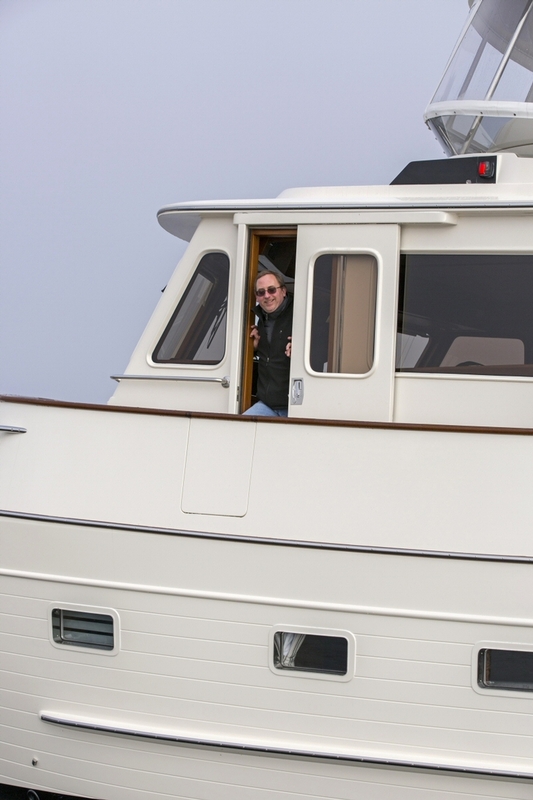 To prevent damage during docking, the handrail is located slightly inboard of the bulwark. 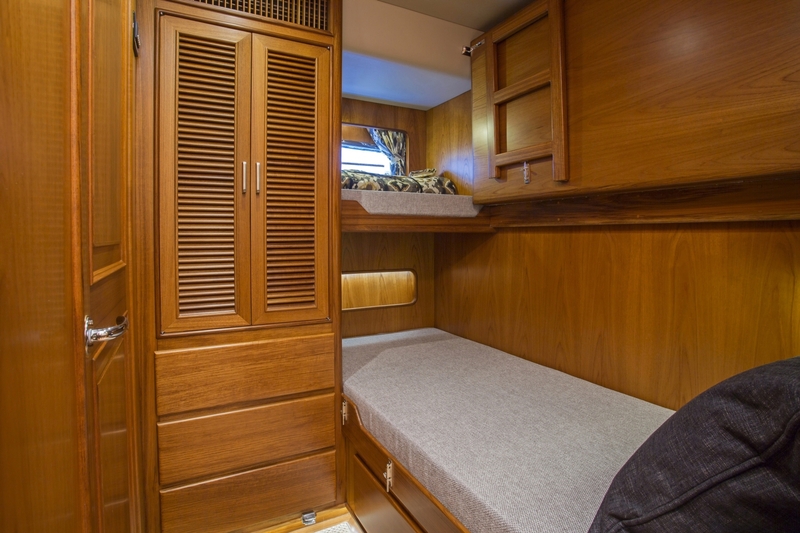 Moving aft, the cabin top features four built-in storage lockers, ideal for stowing lines and fenders. 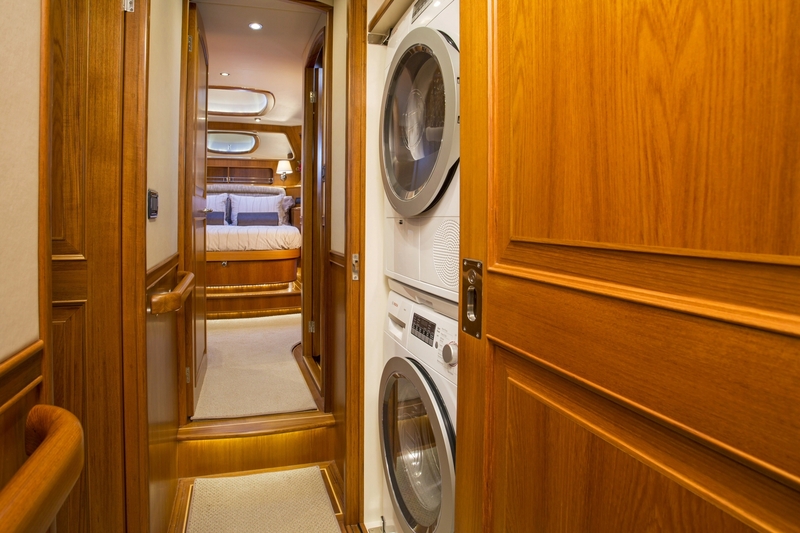 The lockers and the deck drain into specially designed, hidden manifolds, which exit just above the waterline, keeping the topside free of dark streaks. 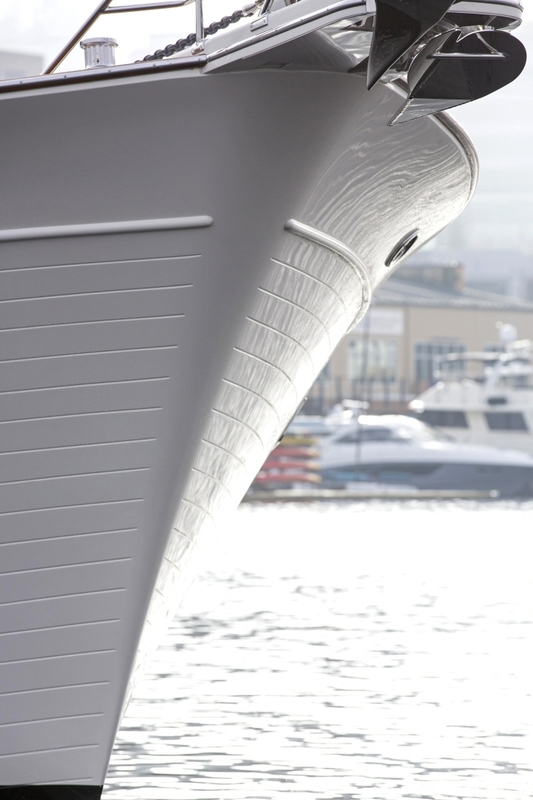 Fleming also pays special attention to the number, position and size of its mooring cleats, and the F65 features four large cleats on both the port and starboard side forward of the deckhouse, making it easy to properly secure the yacht in a variety of situations. Teak or non-skid decking can ordered for the foredeck. 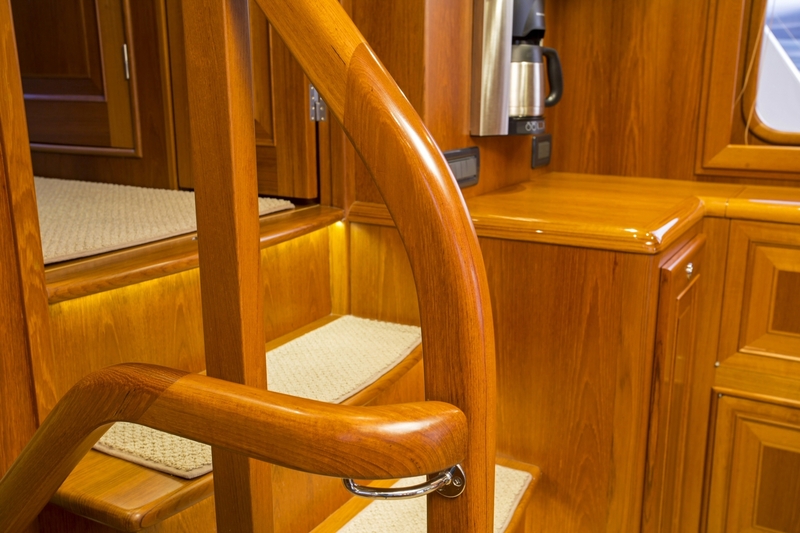 Convenient handrails are located on the forward coach roof, and together with the teak or stainless handrail above the bulwarks, it is safe to move along the foredeck in a seaway. 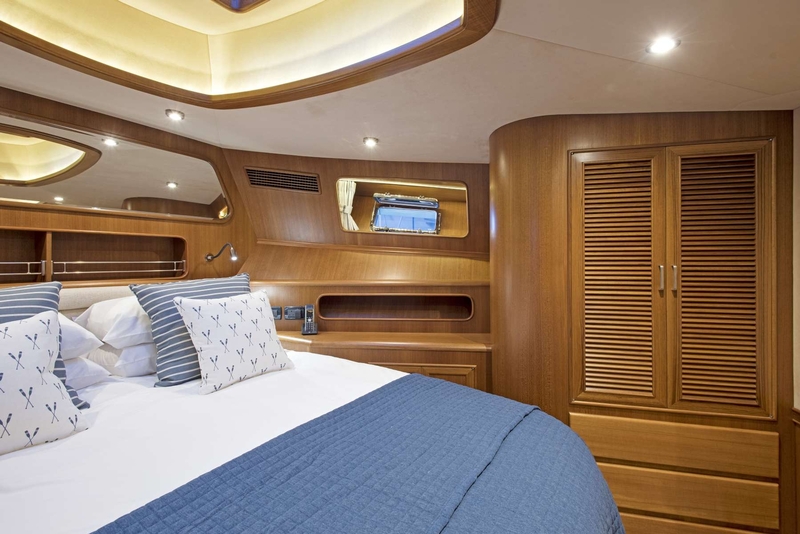 Protection against heavy weather is provided by the Portuguese Bridge, which features port and starboard gates for access between the foredeck and the side decks. 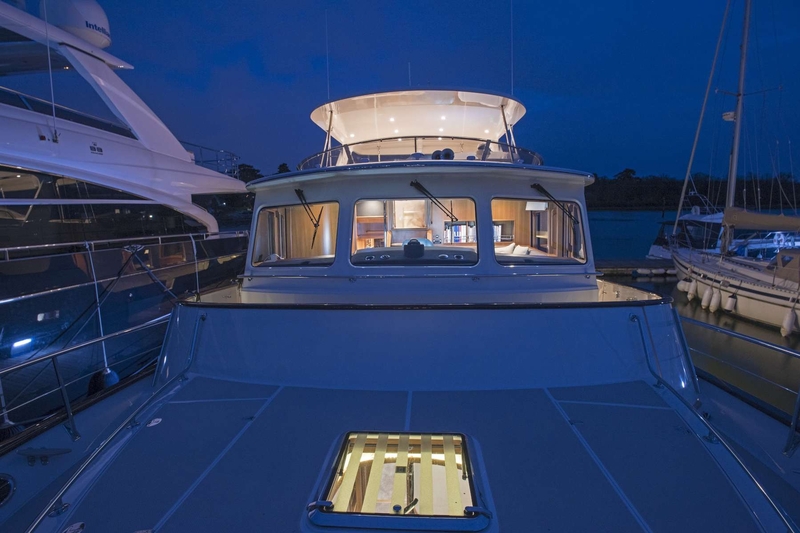 Deck level courtesy lighting enhances safety after dark. 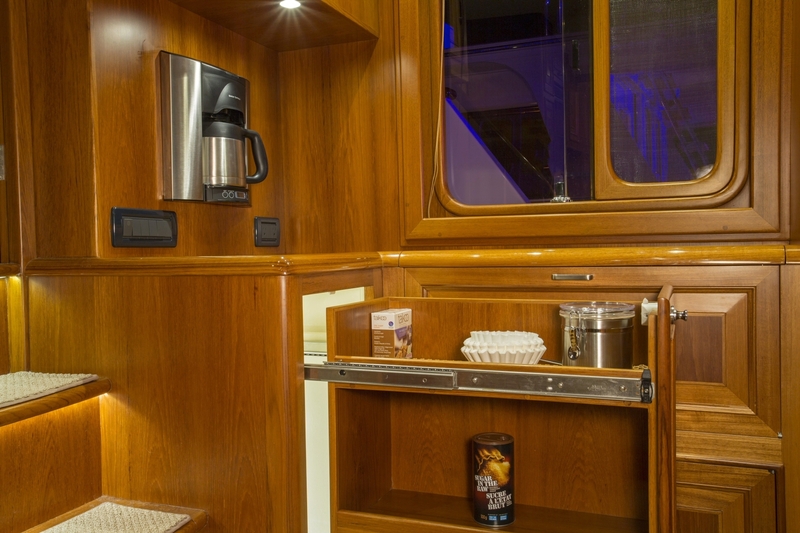 The aft section of the Portuguese Bridge features built-in storage lockers for a variety of cruising gear. 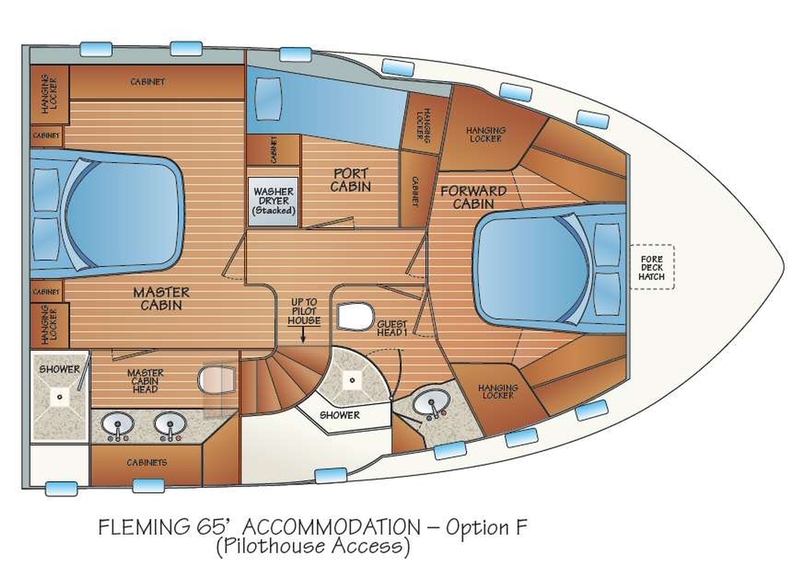 One of Fleming's signature design features is its wide side decks that enable safe, sure-footed movement from bow to stern while at sea and during docking manuevers. One of Fleming's signature design features is its wide side decks that enable safe, sure-footed movement from bow to stern while at sea and during docking manuevers. Heavy duty, stainless steel handrails are strategically located to minimize risk of injury. 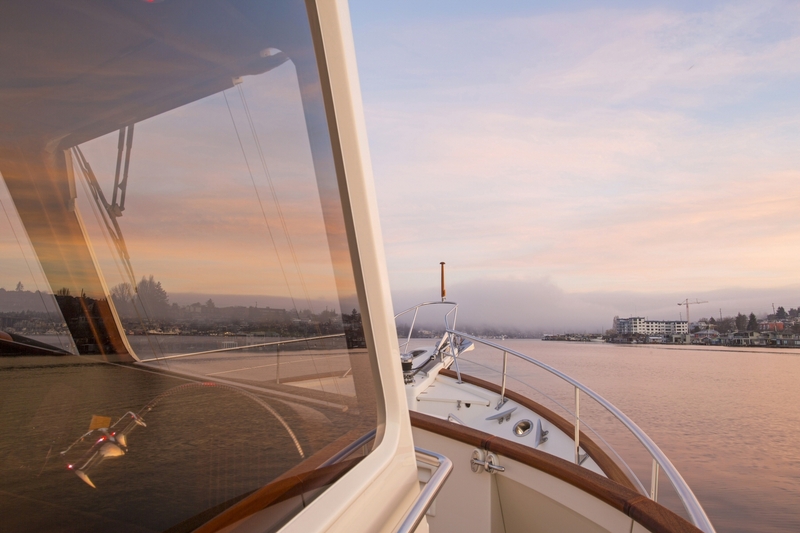 For convenient, effortless boarding in a variety of situations, there are port and starboard boarding gates at both the high and low deck levels, for a total of four. For added convenience and safety, these gates open inboard. 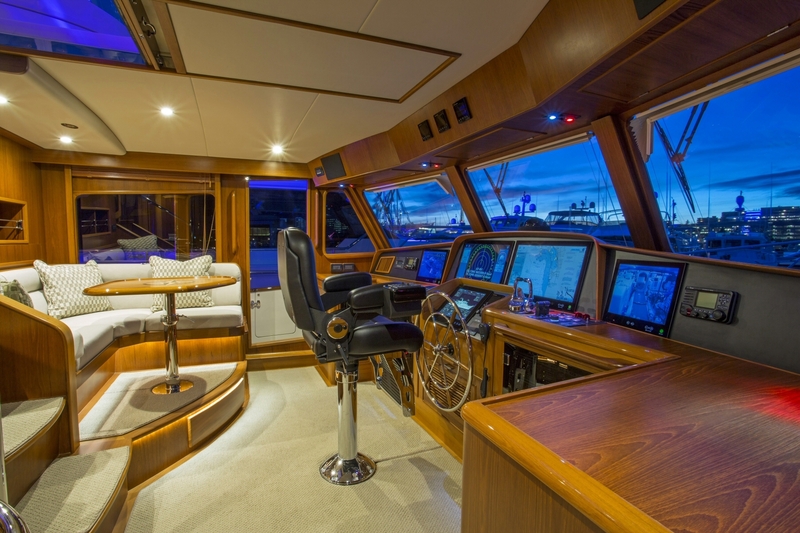 The large cockpit space is beautifully finished with teak decking for its superior non-skid properties and sound dampening qualities. 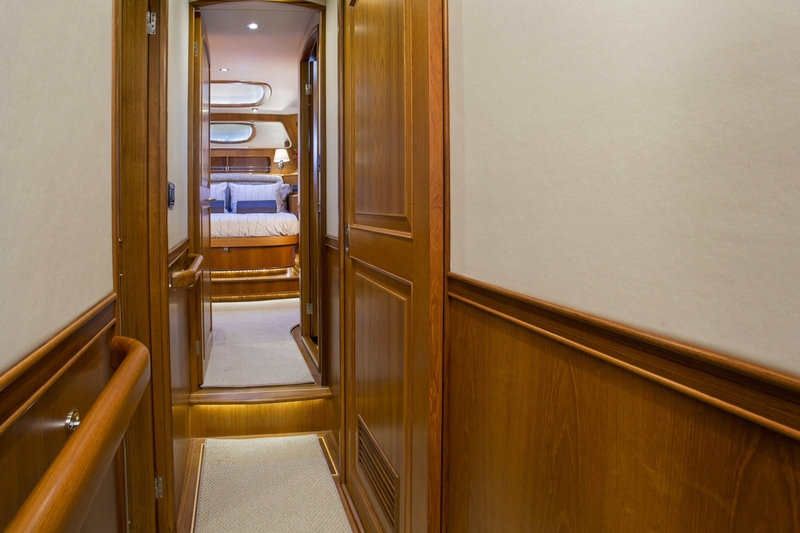 Access to the area is via a boarding gate in the transom. Adjacent to the gate is a freshwater shower fitting as well as a saltwater washdown hose bib. Standard are aft engine and thruster controls, which make backing into a slip a less stressful procedure. 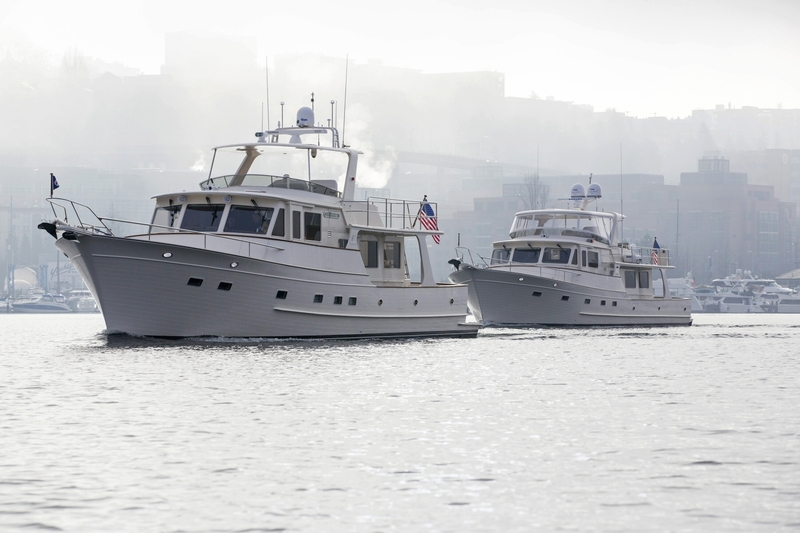 Optional are two working winches, which are invaluable when docking "Med" style. 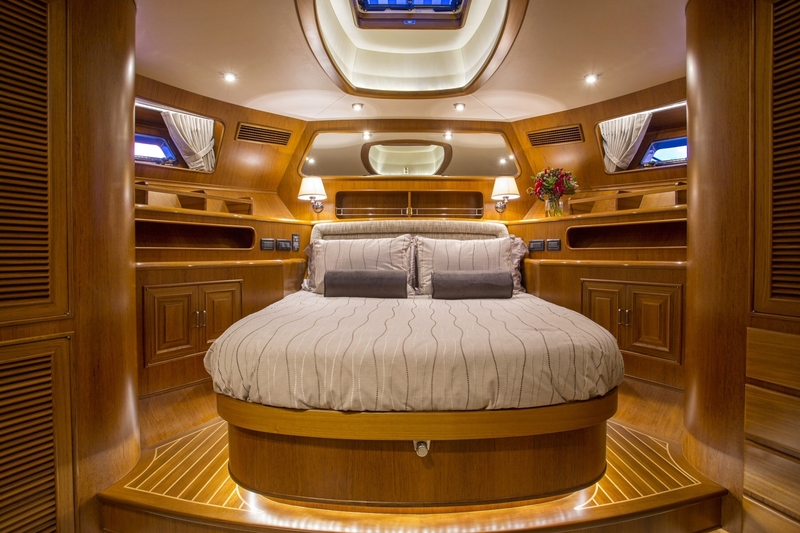 Two 50-amp CableMaster power cord systems are located in the transom, one on the port side, one starboard. The engine room air intake vents are located under the port and starboard cockpit coamings to prevent salt spray from entering the engine room. 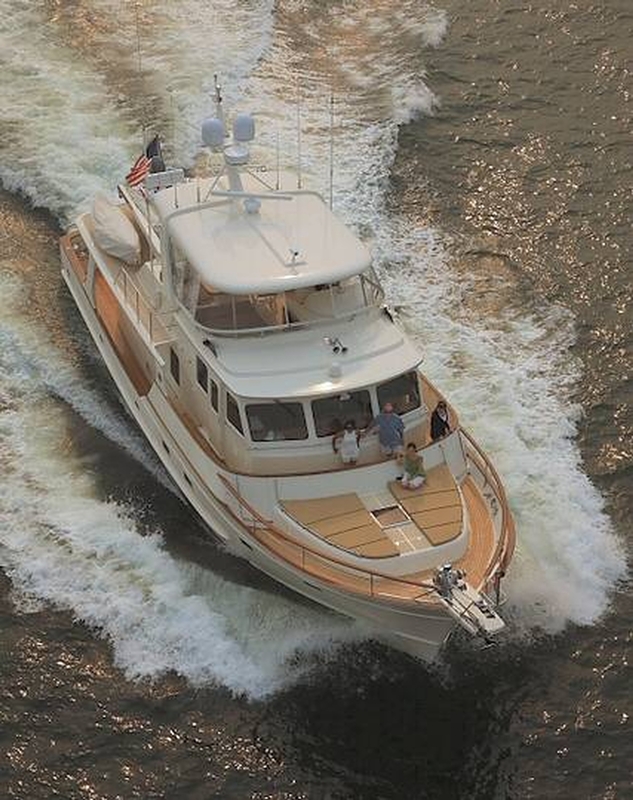 The flying bridge is easily and safely accessed by the 5-step stairway from the pilothouse. 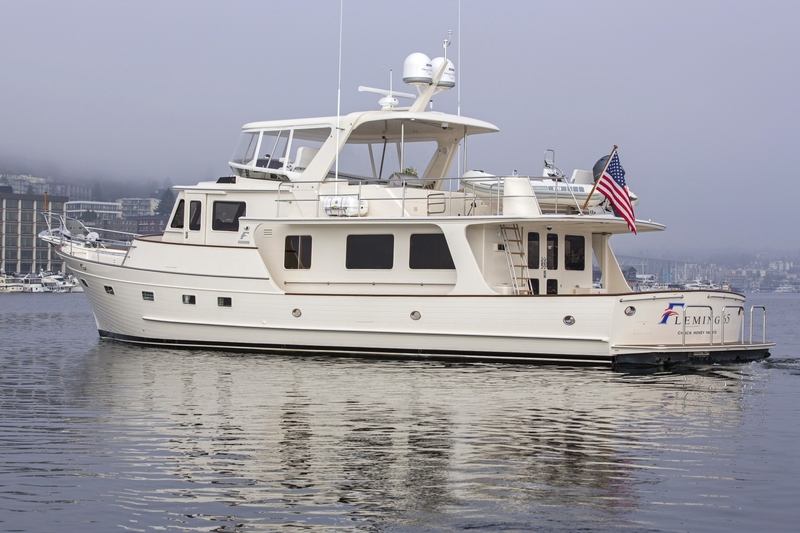 The flying bridge is easily and safely accessed by the 5-step stairway from the pilothouse. The upper helm, located on the port side, is slightly raised to enhance visibility forward and features a built-in double helm seat and a console for full instrumentation and electronics. A U-shaped settee with storage underneath and dining table that seats 6 to 7 is standard. 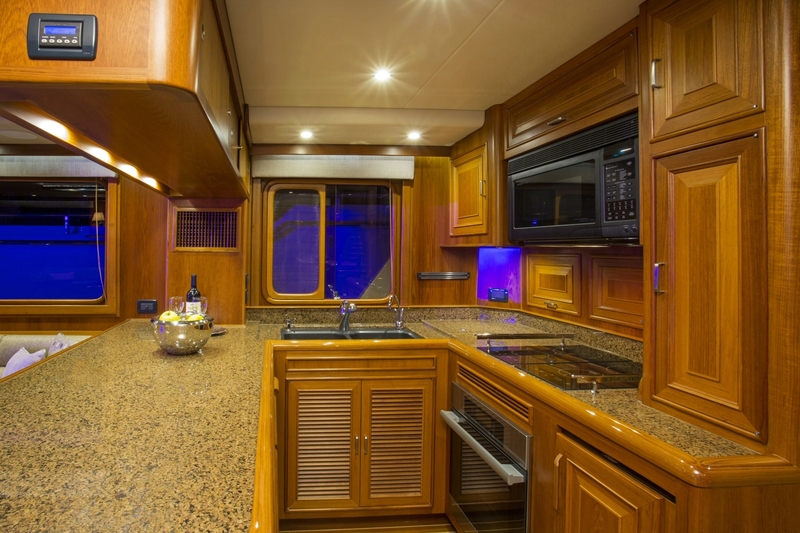 Also optional is a hardtop with a canvas-glass enclosure, which creates additional all-weather living space. 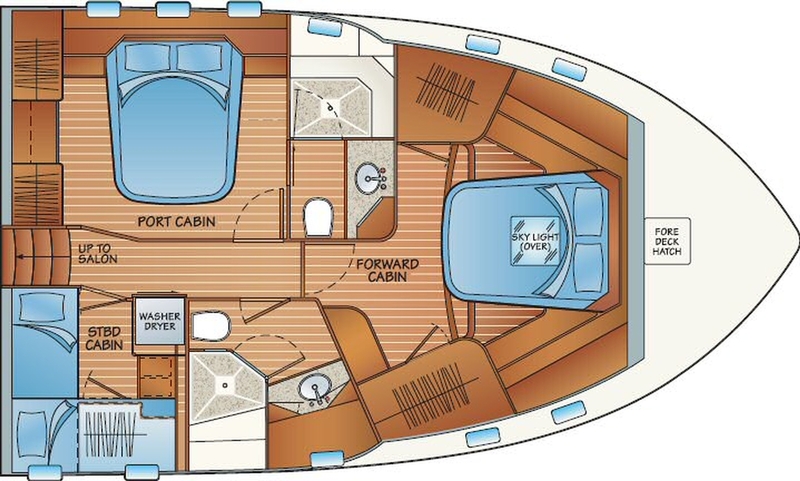 Aft of the flying bridge area is the boat deck, with space for a 16-foot inflatable yacht tender. A 1500-lb. capacity Steelhead hydraulic davit system is standard as is a freshwater hose bib and 110 VAC (230 VAC for European version) outlet for keeping the tender's battery charged. The stainless steel safety rail has a removable section for launching a life raft. 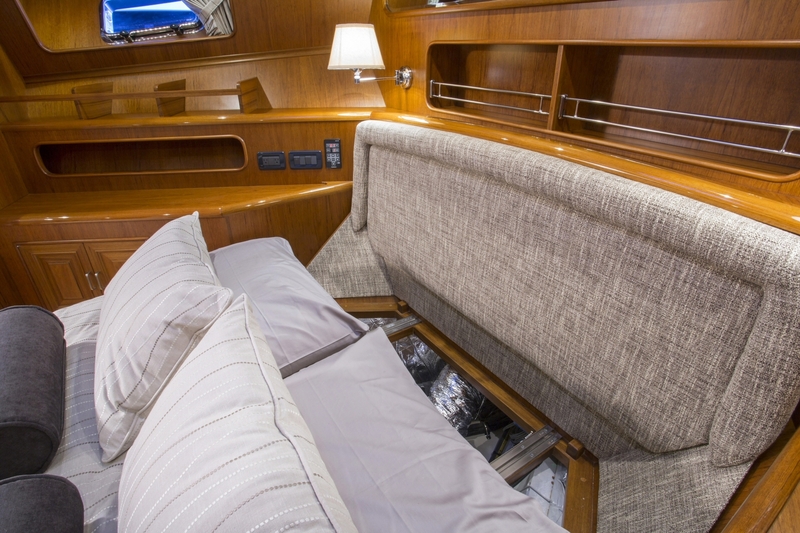 Typical of Fleming's obsessive attention to details, the boat deck drains to a series of built-in, stainless steel drains connected to a drain manifold system that exits just above the waterline to prevent streaking of the cabin sides and topsides. 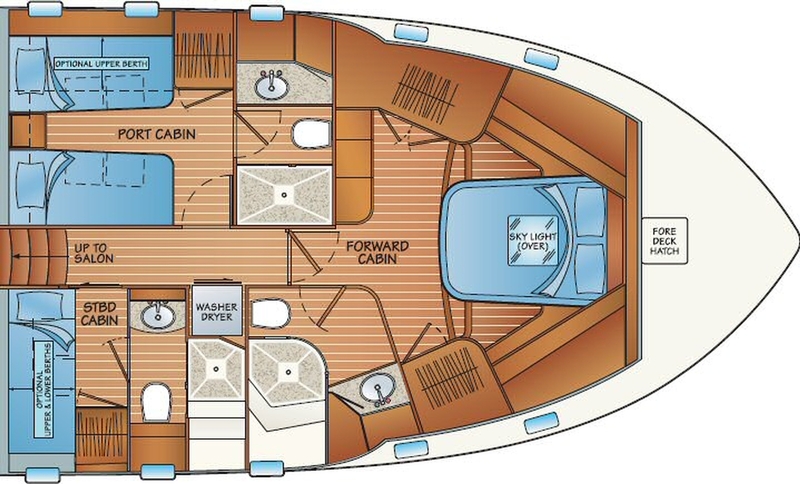 The large, spacious main saloon can be built with a number of different arrangements. 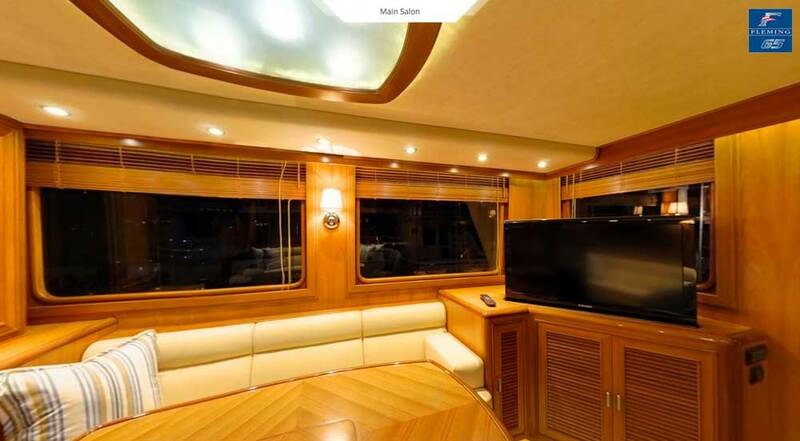 A dedicated dining area can be located to starboard with a large settee area to port. 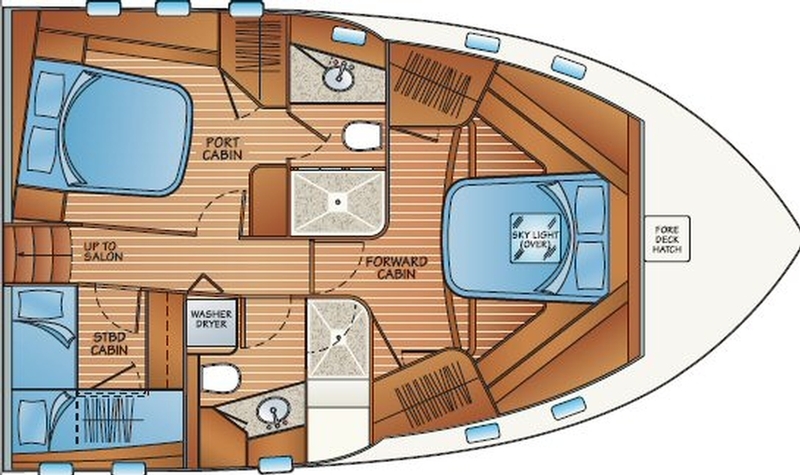 The large, spacious main saloon can be built with a number of different arrangements. 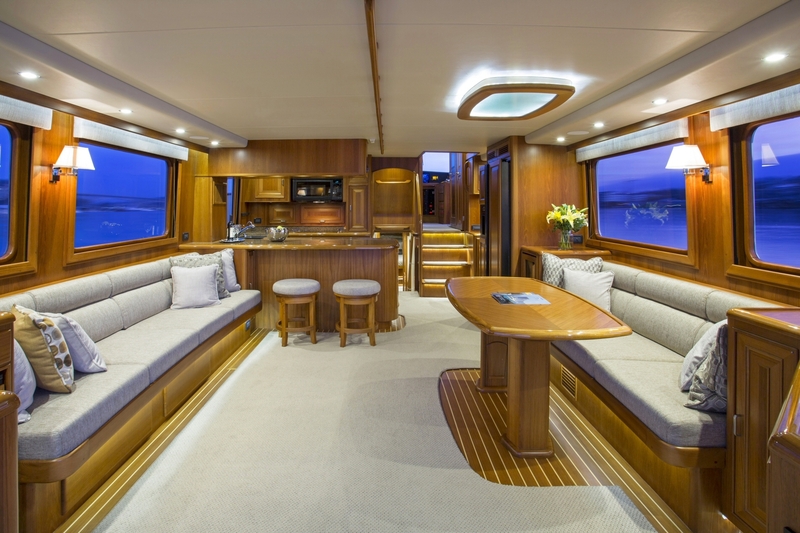 A dedicated dining area can be located to starboard with a large settee area to port. 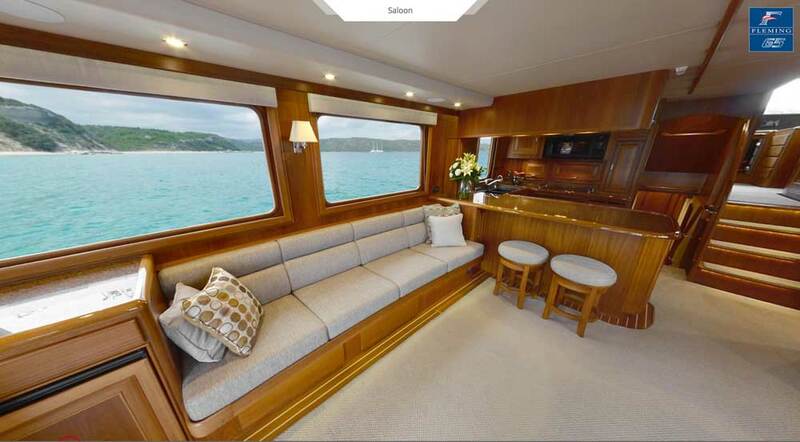 In place of the dining area, a second settee can be located on the starboard side opposite the main settee. 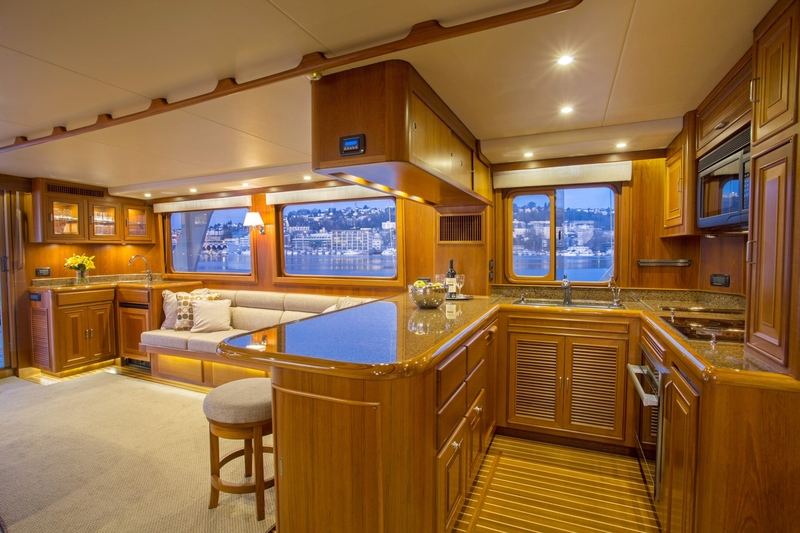 Or, a large, built-in cabinet can be built on the starboard side with lounge chairs facing the main settee. A teak hi-lo dining/coffee table is standard. A soft, ultra-suede headliner provides a sense of warmth and style, and there is space for a 42" flat panel home entertainment center. The galley features a 23-cu. 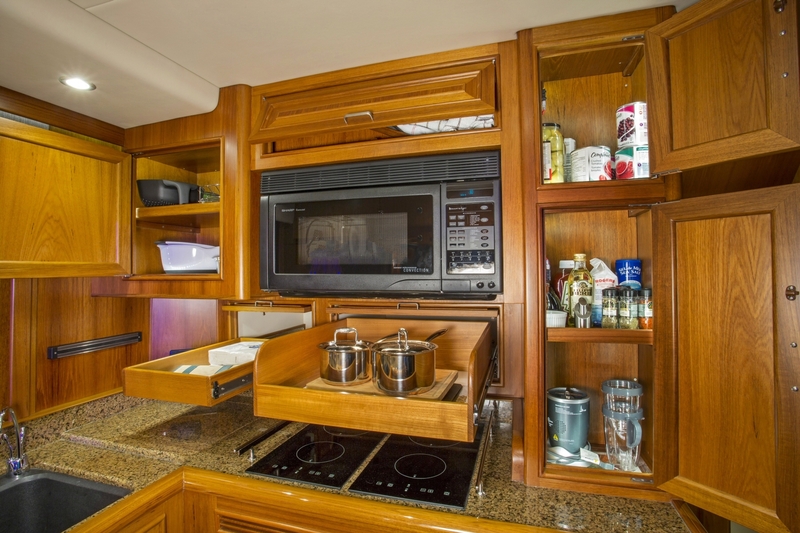 ft. side-by-side refrigerator/freezer on the starboard side and a built-in dish cabinet and pantry space. Granite counter tops, a double sink, instant hot water dispenser, waste disposal, convection microwave, flush cooktop are standard. There is room for an optional dishwasher. 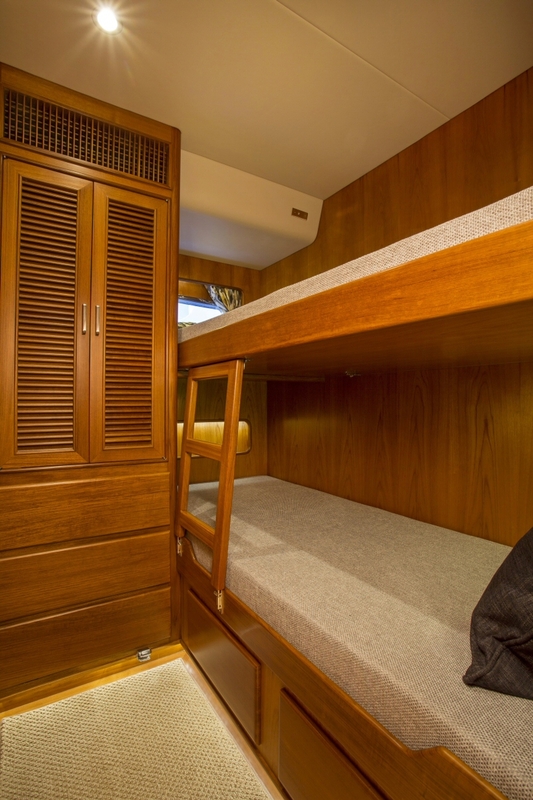 A number of layouts are available for the 3-stateroom accommodations area. 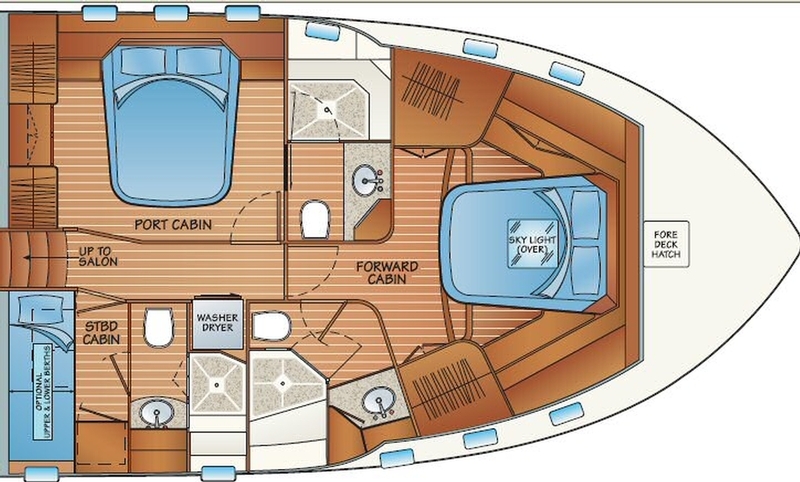 A number of layouts are available for the 3-stateroom accommodations area. Common to all arrangements is a central passage, which is just 4-steps down from the main saloon area, a welcome departure from the steep, narrow, spiraling staircase typical of so many lesser designs. 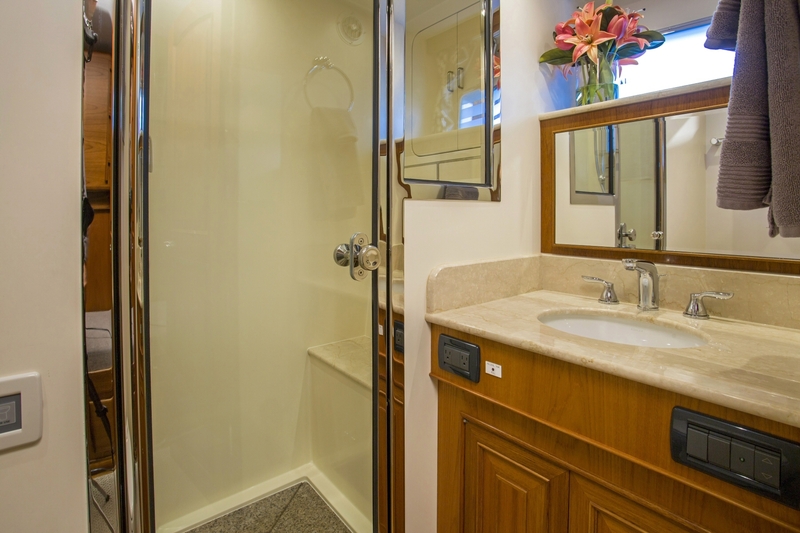 In most cases, the owner's stateroom is located forward and features an island berth that lifts for easy storage beneath, a private head, two large hanging lockers and a vanity. 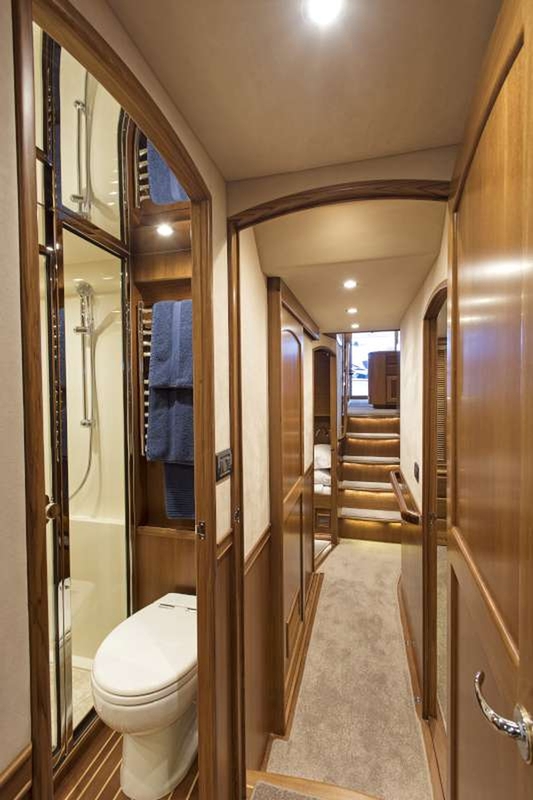 The starboard guest stateroom can be built with two over-under single berths or with one berth and a private head. 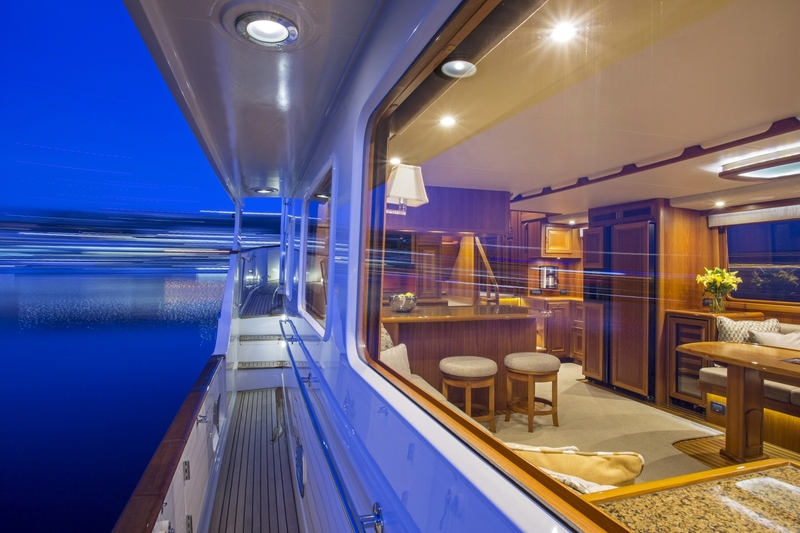 A new, increasingly popular layout has the owner's cabin to port and a VIP stateroom forward. 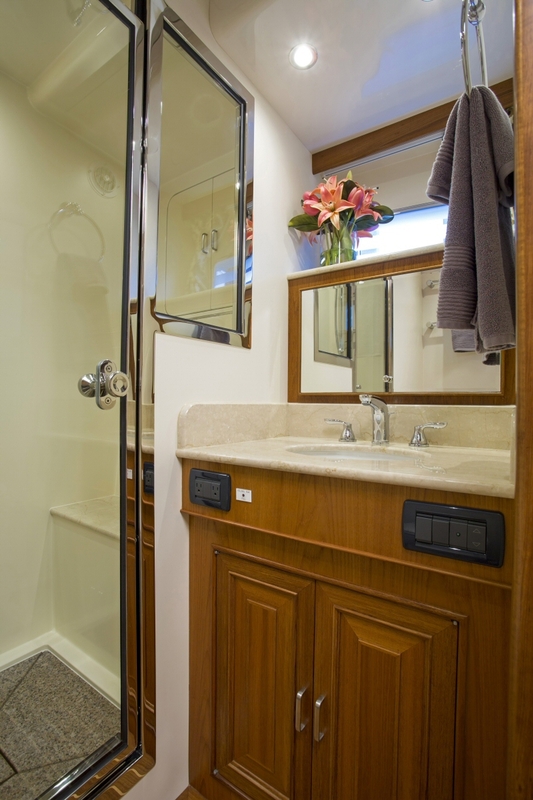 A separate washer/dryer is located in the passageway along with a supply closet and slide-out laundry hamper. 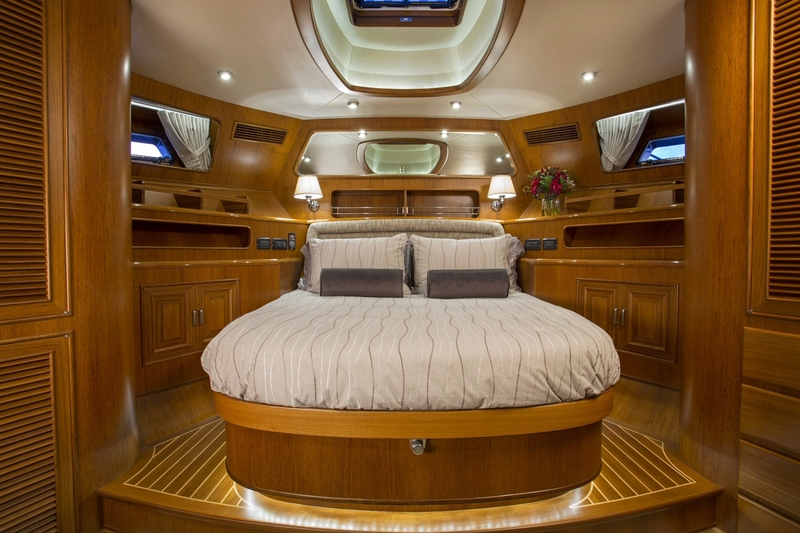 The entire accommodations area is finished in warm teak with an ultra-suede headliner. Either of the plans contributes to an easy and convenient traffic flow. 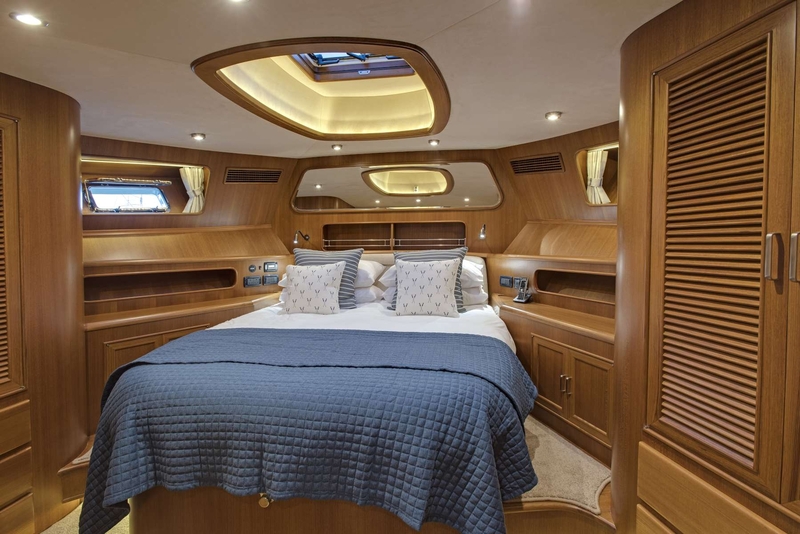 Accessed from an exterior hatch aft of the saloon doors that leads to a submarine-style door, the engine room is signature Fleming - well thought out, extremely functional and beautifully finished. 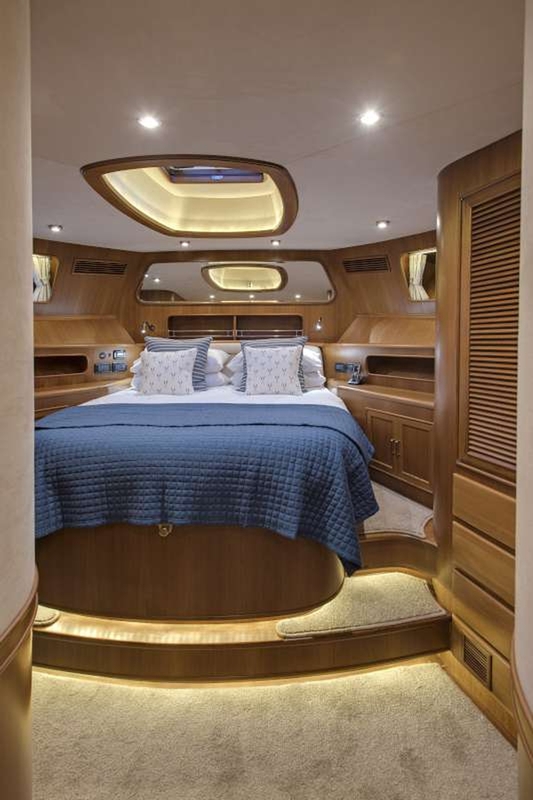 Accessed from an exterior hatch aft of the saloon doors that leads to a submarine-style door, the engine room is signature Fleming - well thought out, extremely functional and beautifully finished. 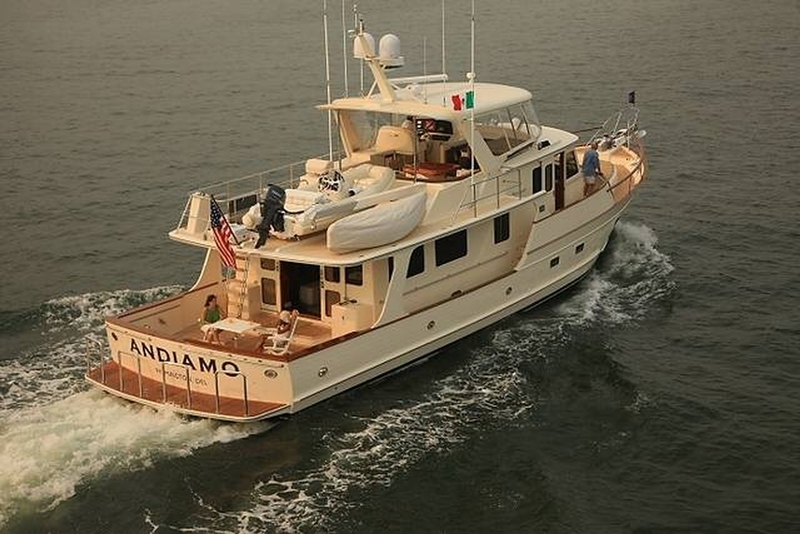 Standard power is a pair of MAN 800 hp diesel engines, and MAN 1100 hp engines are optional. There is room for two AC generators, and most owners choose to install two, one with a smaller output for use during moderate power requirements and one larger unit when more power is called for. To achieve the extremely low sound and vibration that Flemings are well known for, AquaDrive anti-vibration systems are utilized that transfer the thrust of the props directly to the hull and isolate the engine by using soft engine mounts. 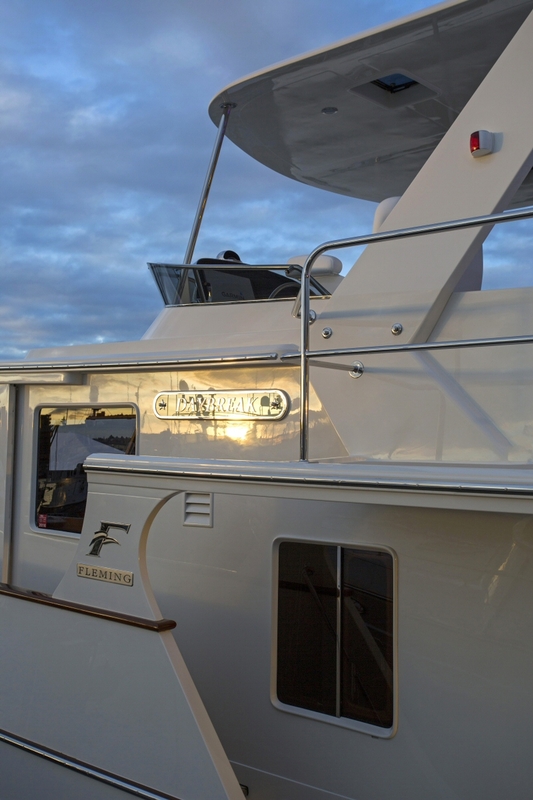 The engine mounts are installed on full-length, polished stainless steel channel sections, a system that has been standard on all Flemings since their inception in 1985. 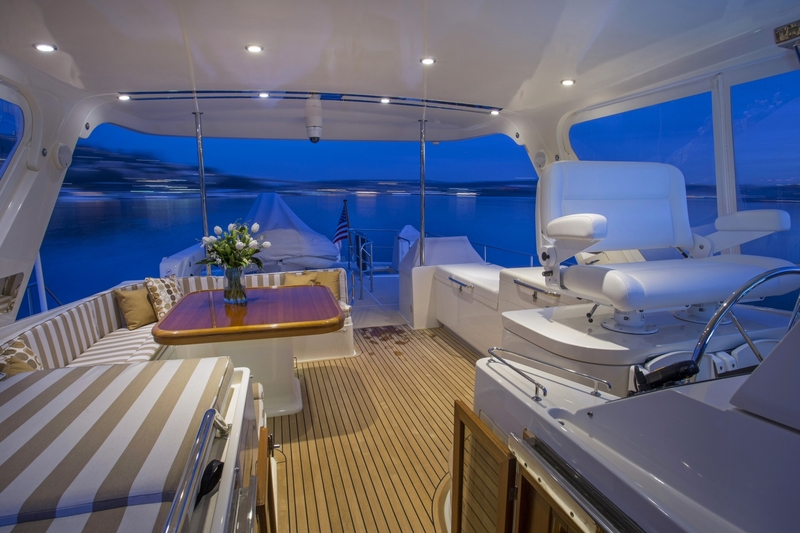 The aft lazarette houses the water tanks, steering gear and air conditioning compressors while also leaving ample room for storing cruising gear such as spare anchors, rode, lines, fenders and parts. Having the AC compressors located here instead of in a hot engine room improves performance and efficiency and minimizes noise. 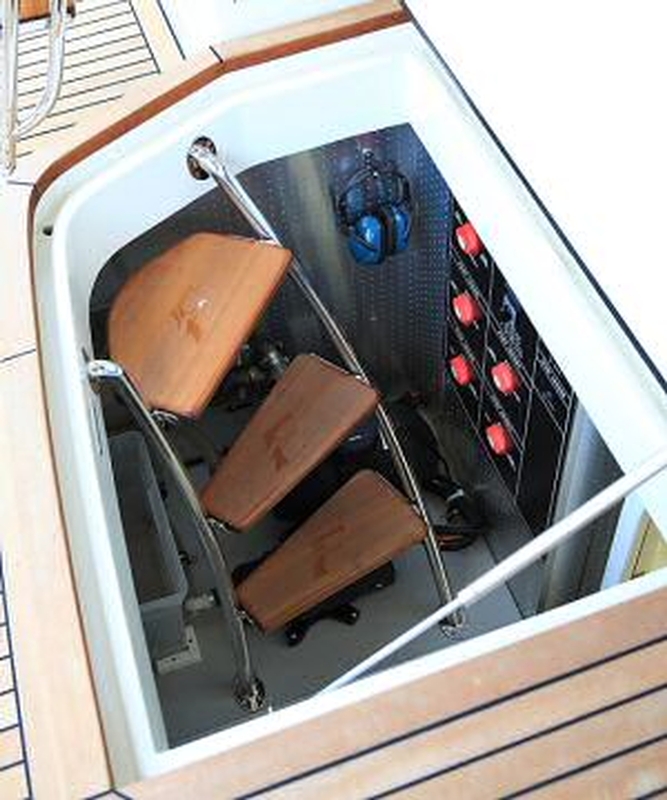 Main access is through the outside engine room hatch and down a set of curved stainless and teak steps. There are two additional cockpit hatches that allow quick access to stowed gear. 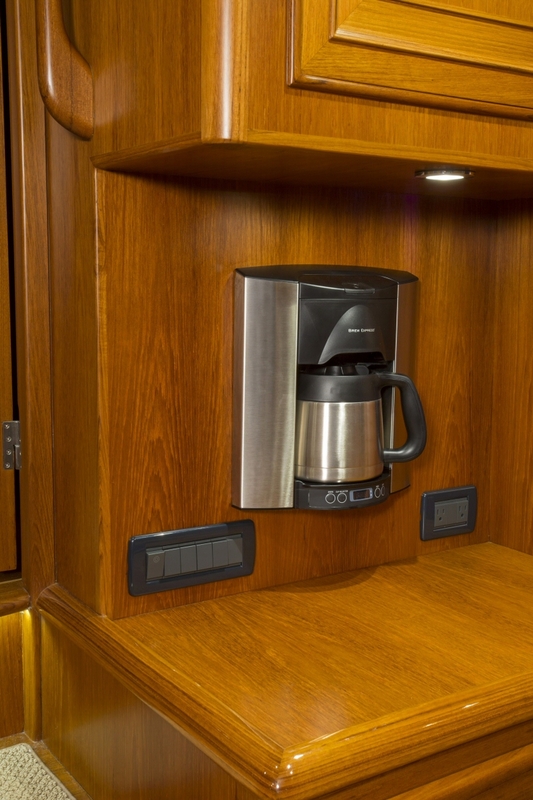 All battery selection switches are located on a bulkhead for easy, instant identification, and a separate 12-volt DC distribution panel specific to the systems in the engine room is nearby. Two freshwater pumps, one AC and one DC, are installed and plumbed, providing instant switchover capability in case of failure. 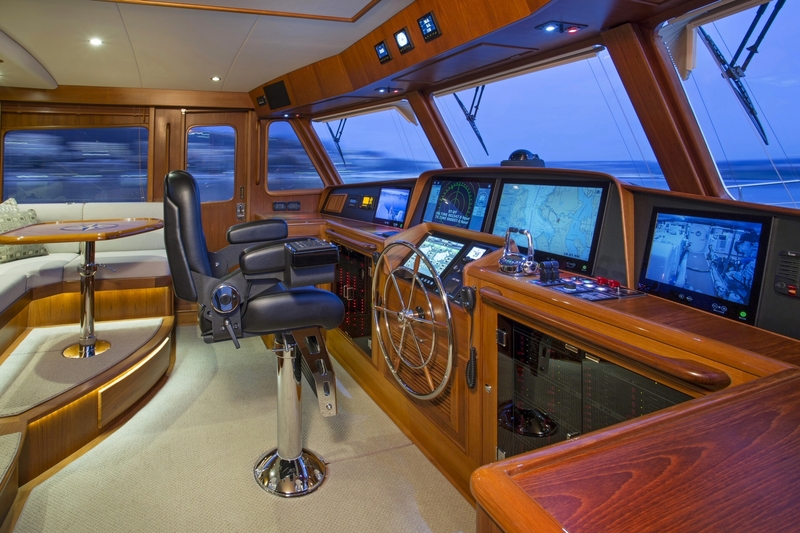 The Fleming 65 pilothouse is the nerve center of the vessel and can be completely separated from the activities throughout the rest of the yacht by its bi-panel teak door. 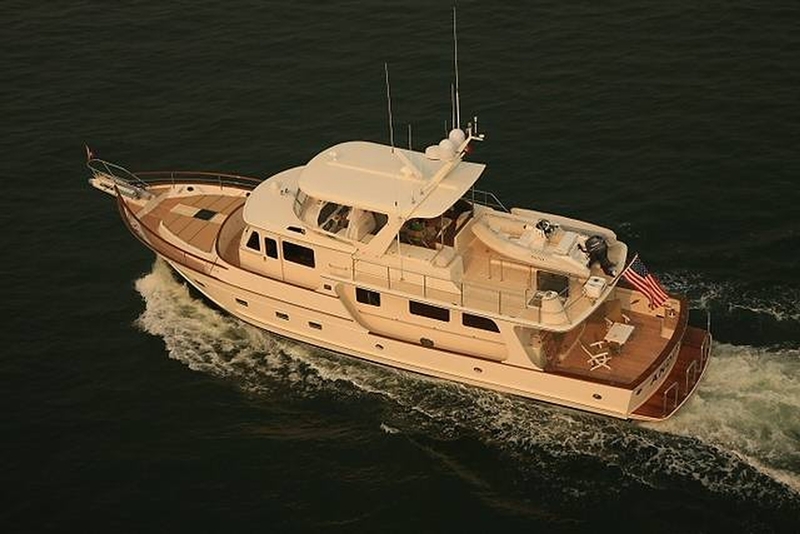 The Fleming 65 pilothouse is the nerve center of the vessel and can be completely separated from the activities throughout the rest of the yacht by its bi-panel teak door. 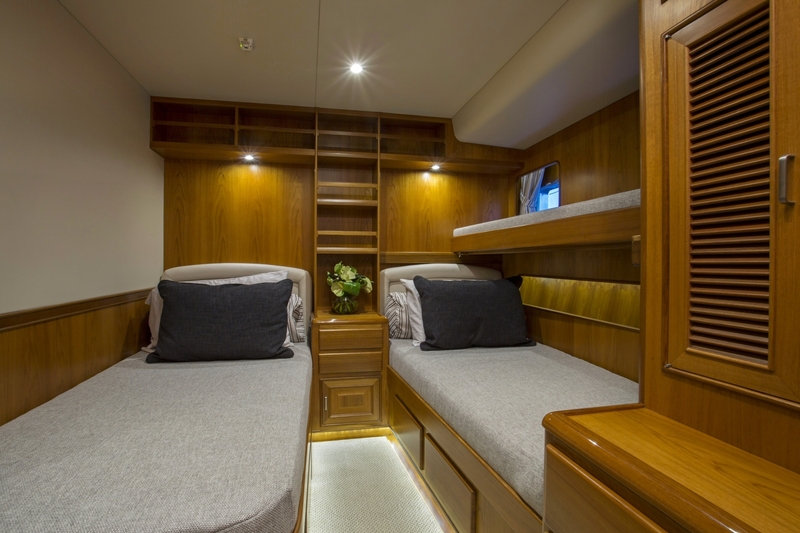 The day head to starboard can also be ordered as a "wet-head" complete with shower, and an insert for the settee creates a convenient watch berth. 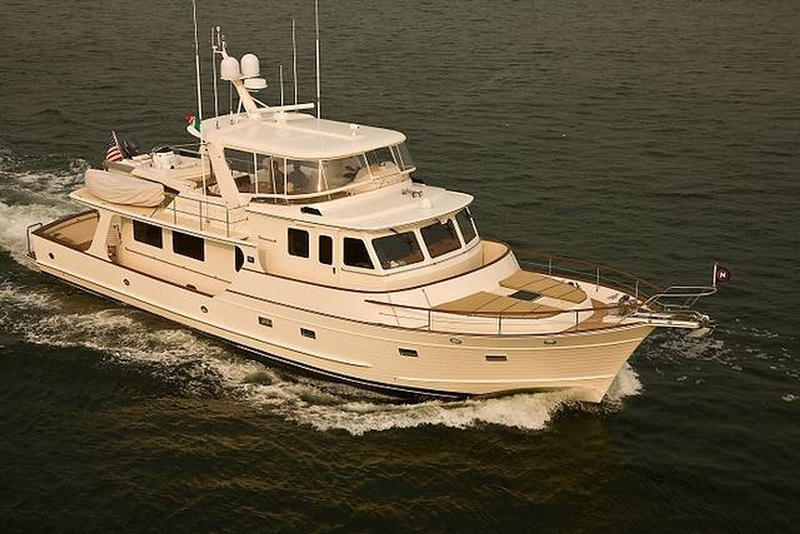 This arrangement allows the pilothouse to be used as an extra cabin when necessary. Either one or two helm chairs can be installed, and a raised settee and table provide additional seating for four. The forward console area has been designed to accommodate a full array of today's modern electronics, and easy accessibility has been built in to allow for service and eventual upgrades. The electrical distribution panelsare below the main controls and are hinged and illuminated for access and service. 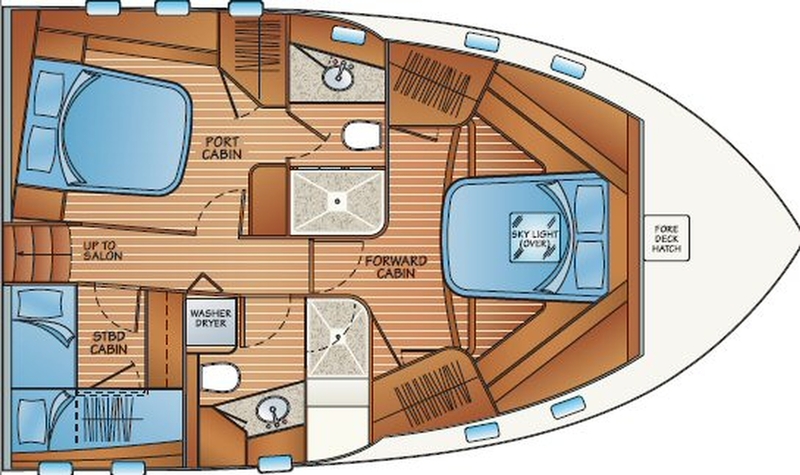 Visibility forward and to port and starboard is excellent, and two sliding doors open to the wide side decks. A traditional teak and holly sole is standard. 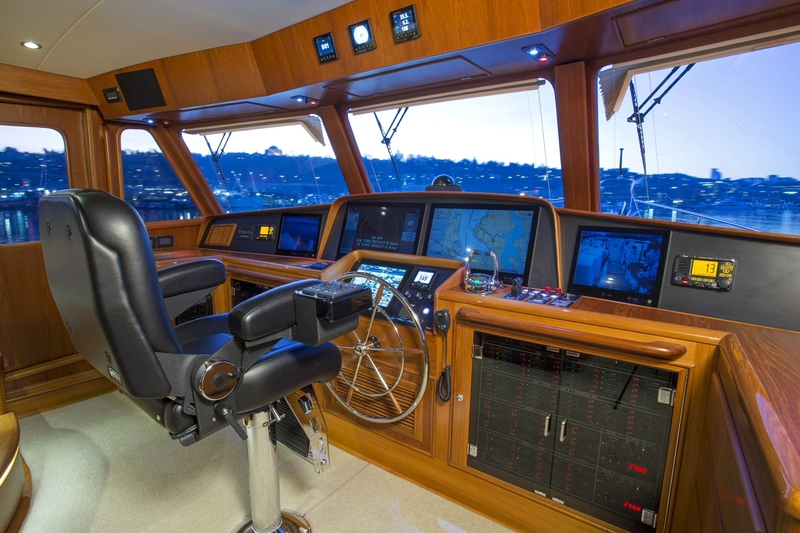 There are large drawers and working space for charts, cruising books, navigation instruments, binoculars, cell phones and chargers, log books, flashlights and everything else a captain needs to chart and follow a safe course. 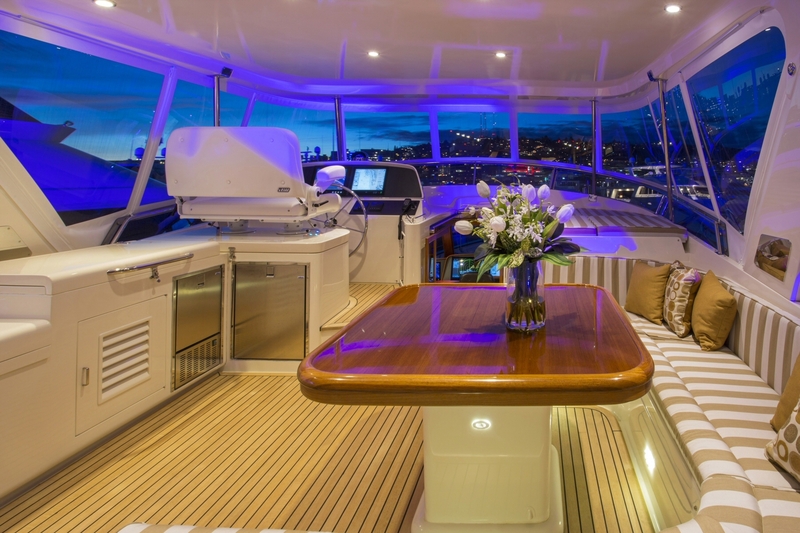 A large stainless steel and teak-trimmed destroyer wheel fit the ambience of this ultimate cruising yacht. 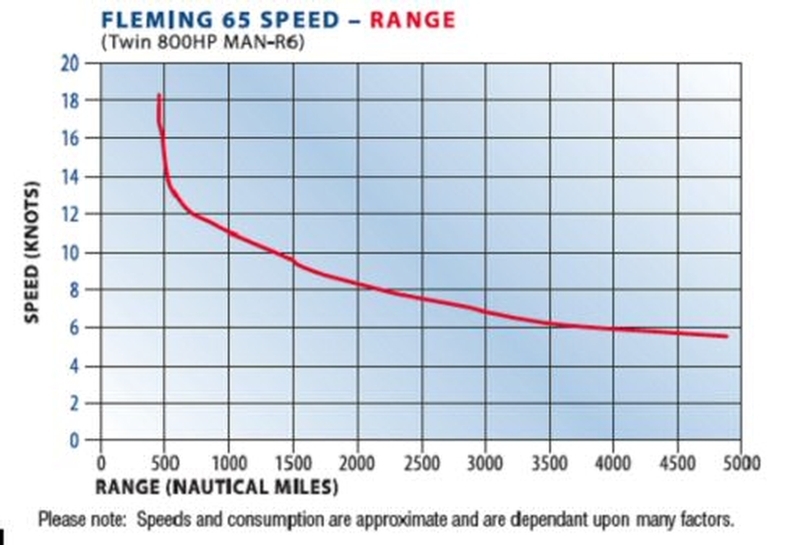 The following performance curves represent the approximate speeds, fuel consumption and range of a Fleming 65 powered by twin MAN 800 hp diesel engines. The actual performance of an individual vessel will depend on many factors including, but not limited to, sea and wind conditions, load of vessel and the condition of the vessel's bottom and running gear.